With the Bay of Biscay and the Atlantic Ocean to the west, Gironde takes its name from the 70km Gironde Estuary, the largest estuary in Europe and the point where the rivers Garonne and Dordogne meet. Tidal and constantly changing from muddy banks to flowing water, the estuary is 70km long and, at its widest point, spans 11km. Commercial shipping navigates to and from Bordeaux on a daily basis, whilst other industrial facilities on its shores include a nuclear power station and two oil refineries. Shore fishing for salmon, lamprey and eels is a regular sight as migratory fish travel upstream towards the Dordogne and Garonne. On the eastern banks, the best places to view the estuary include those near Bourg and Blaye or along the Route Vert, which winds its way up and down gentle hills from Blaye to Royan. Now part of Nouvelle Aquitaine, Gironde combines sandy beaches with pine trees and, of course, vast vineyards. Amongst others, its’ most famous wines can be found in the chateaux and vineyards of the Médoc, Graves, St Emilion and Entre Deux Mers. Enjoying a vibrant market within France and Europe, the wines are also shipped around the world from France’s third largest port at Bordeaux. There are far too many beautiful chateaux to mention but those that are particularly notable for their wines include Chateau Lafite Rothschild, Chateau Margaux and Chateau d’Yquem. 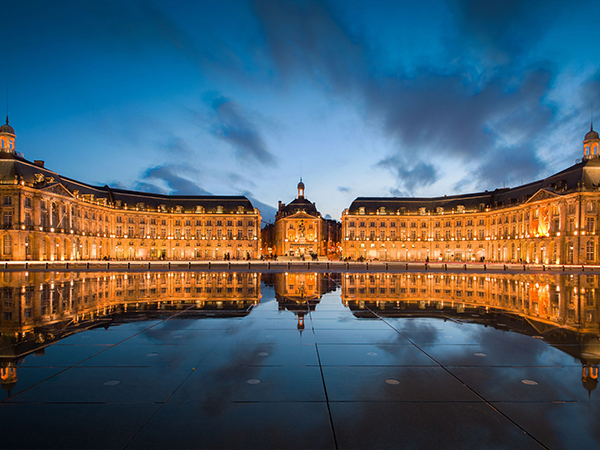 It may not have taken a kiss from a handsome prince to wake up Bordeaux, the Sleeping Beauty of France, but it did take a massive regeneration project. Headed by Alain Juppé, the Mayor of Bordeaux from 1995 to 2004, the plan has transformed the dark, dirty and vehicle-crammed metropolis into a modern, elegant and vibrant city that is second only to Paris. The abandoned warehouses of the 1960’s have given way to an open waterfront complete with a traditional promenade and the Esplanade des Quinconces, Europe’s largest square. Once blackened with grime, the rejuvenated buildings now display the fine Renaissance architecture and ornate balconies that can be found along the river. Just one look at the Grand Theatre and the Musée National des Douanes on the Place de la Bourse illustrates the wealth of 18th century architectural features that await the visitor. Housing a bell cast in 1775 and weighing 7,750 kilos, the Grosse Cloche is one of oldest belfries in France and now rings just several times a year. Also a legend in its own right is the Pont de Pierre, which was the first bridge to be built over the River Garonne at Bordeaux. In order to complete the project which was started in 1819, a diving bell was borrowed from the British to stablise the bridge’s pillars against the strong current that passes at this point on the river. Just a few months before she became Queen, Eleanor of Aquitaine married Louis V11 in 1137 in the church that originally stood on the site of Cathédrale Saint André. Built in the 15th century to house a large bell without creating a risk to the Cathedral’s structure, the Cathedral’s stand-alone Tour Pey-Berland was later used as a shot tower and then as a lead factory. Today, people are able to walk right to the top for one of the best views there is of Bordeaux. 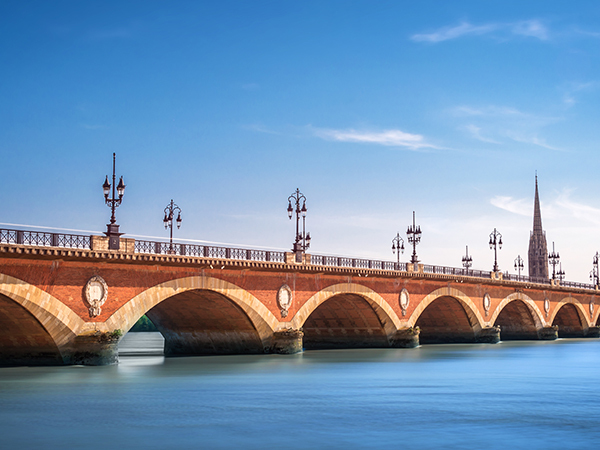 The Pont de Pierre was the first bridge to be built over the River Garonne at Bordeaux. St Emilion forms a cluster of steep, winding streets on a rocky limestone hillside. The Musée National des Douanes on the illustrates the wealth of 18th century architectural features that await the visitor. Now pedestrianised in much of the City centre, including the shopping areas such as Rue Ste Catherine, transport has been greatly improved with the installation of a hi-tech tram system. Taking people home, to work and to many of the other attractions in the City, it can also drop you off at the newly completed La Cité du Vin. Now a UNESCO World Heritage Site, St Emilion forms a cluster of steep, winding streets on a rocky limestone hillside nestled amongst vineyards that stretch almost as far as the eye can see. 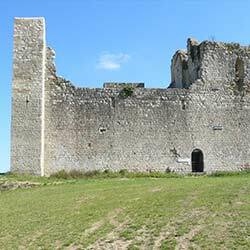 As a medieval bastide town, its fortifications can still be viewed and include a 53m high bell tower and the formidable keep at the Chateau du Roy. However, there is much more to see below ground. A guided tour takes visitors through the 8th and 10th century catacombs, into a monolithic church carved out of the rock in the 9th century, and down to the Grotte de l’Ermitage where it is believed that St Emilion spent the last 17 years of his life. Situated on the Silver Coast (The Coté d’Argent), Arcachon stands on the 250 sq km Bassin d’Arcachon. With white sandy beaches, thermal baths, forest walks and even a Casino, the town and Bay are playgrounds for holidaymakers and locals alike. Whilst relaxing and enjoying the regions wines, why not try an oyster or two. Sitting on the Bay, Gujan Mestras is known for its oyster production, with cultivation taking three or four years from egg to crate. 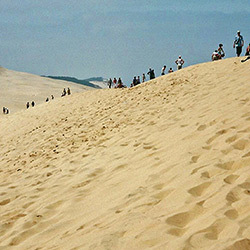 Said to be one of the grandest sights in France, the sand Dune du Pilat (Pyla) sits at the mouth of the Bay. 105 metres high and 500 metres wide, it is an incredible 2.7km long. Thankfully for some, wooden steps make the journey to the top a bit easier where the view of the ocean, the coast, the forest and the dune itself is unforgettable. For bird lovers, the Parc Ornithologique du Teich is a nature reserve where 323 species of birds have been spotted in the last 43 years, whilst a number of lakes, such as the Etang de Lacanau, provide quieter spots for swimming and water sports. The Gironde could fill this website on its own and, as one can imagine, this is only a tiny selection of the delights it can offer. You will find a wide selection of other tourist spots, churches, hotels and events in our Business Directory and What’s On pages. Why not take a look, you can search under category type, town or region. Visit Gironde Tourisme for more walking (randonée) paths. 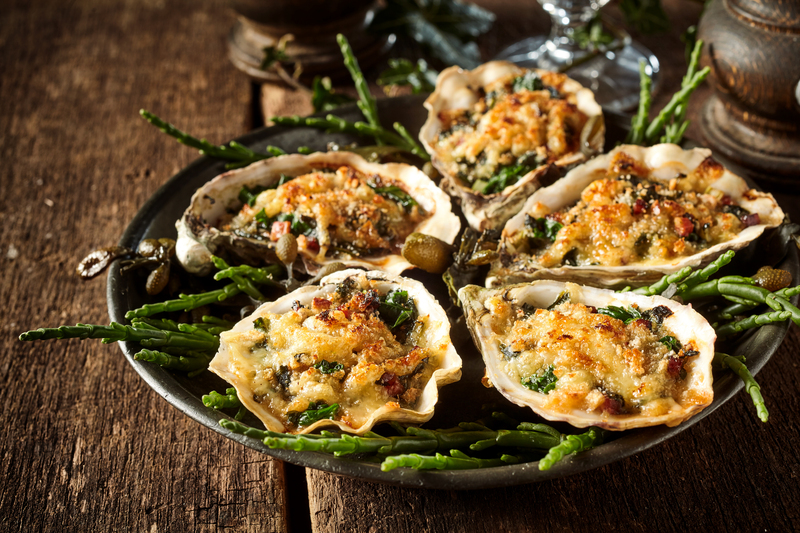 Oysters Rockefeller – an American classic! Sorry France, but we first had these in Antoine’s in New Orleans where they were created in the late 19th century and named after the richest man at the time, John D Rockefeller. – Preheat the oven to 230°C. – Using a processor, chop a garlic clove, add two cups of fresh washed spinach, a bunch of watercress and 2 spring onions, turn on and off until all the leaves are finely chopped. – Combine half a pack of butter with ½ cup of breadcrumbs, 1 tsp ground fennel seeds, 1 tsp of hot sauce such as tabasco. Add 2 tbs Pastis. – Mix the spinach and breadcrumb mixture together. Shuck the oysters (best done with an oyster knife, pushing the knife into the gap at the end and twisting upwards to open), remove any odd bits of shell, leaving a clean oyster in one shell. – Sprinkle rock salt over the roasting rack. Top each oyster with the mixture, sprinkle with parmesan and bake for around 7 minutes until browned. – Serve on a bed of the baked sea salt or samphire (sea asparagus). Voila!